New England SpinTech offers technical and corrective services for all rotating equipment and components. Our goal is to get your machinery up and running with little lag time, and we are able to balance rotors and shafts from under an ounce to up to 2,000 lbs. No job is too big or small for the experts at New England SpinTech. We provide field service throughout the northeast region, with a focus on machine balancing, laser alignment, and vibration analysis. We are not limited by location; in fact, on-site, we can address rotating errors in a wide variety of products, including all types of fans, mowing and mulching heads, wire winders, centrifuges, and more. In addition to our field services, we provide shop service for clients across America and Canada. From medical and dental devices to specialty rotors, couplings, electric motor armatures and more, our shop has the tools to fix your problem equipment. 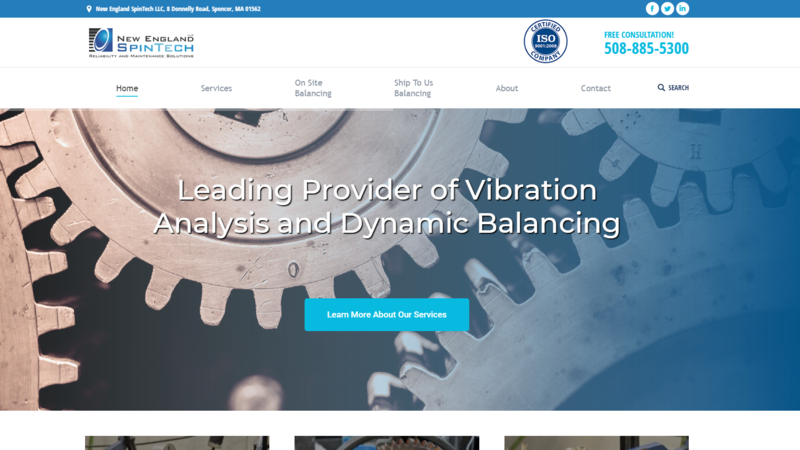 Our experts in the field and in-house have over 80 years of combined experience with vibration analysis and dynamic balancing. We are also experienced in many other mechanical fields, including laser alignment services, industrial machine repair, machine assembly, proper lubrication practices, and corrective and preventative maintenance. Our years in the field and in the shop have provided us with a wealth of knowledge, and we have seen the results of proper and improper mechanical practices. As a result, we emphasize a rigorous series of certifications for all our Category II and III vibration engineers, analysts, and technicians. Along with these certifications, our technicians learn how to create easy-to-read Engineering Reports with clear and accurate recommendations. In addition to the above, we also offer full-time, part-time, and temporary maintenance staffing at your facility, and can provide assistance with your scheduled shutdowns and outages. New England SpinTech is here for you every step of the way, from service to reporting, and everything in between.